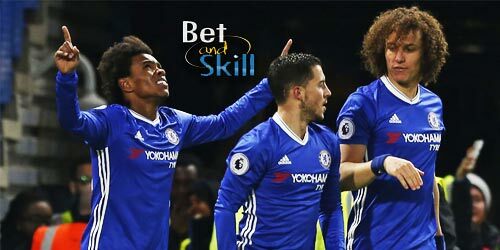 After two consecutive Premier League defeats, Chelsea will be desperate for victory when they welcome Watford to Stamford Bridge on Saturday's early kick-off. 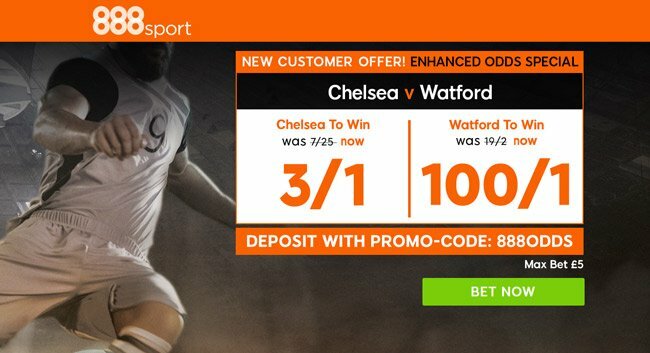 Read below here our Chelsea vs Watford betting preview with predictions, betting tips, starting lineups, team news, enhanced odds, bookmakers promotions and no deposit free bets on this clash! Chelsea will look to bounce back to winning ways in the Premier League after their a home defeat to Manchester City, a shocking away loss at Crystal Palace last weekend and a disappointing 3-3 draw against Roma in midweek's Champions League match. The Blues are still well placed in their UCL group but they sit 5th in the Premier League standings, 9 points shy table toppers Manchester City. Antonio Conte's men beat Watford both home and away in the Premier League last season by a single goal margin, courtesy of very late deciding goals. The hosts will have to check on David Luiz, Victor Moses and Tiemoue Bakayoko ahead of this clash. Andreas Christensen and Antonio Rudiger are on stand-by for the defensive spot, Davide Zappacosta could start at right wing-back while the youngster Kyle Scott could partner Cesc Fabregas in the middle of the park. In fact, Danny Drinkwater and N'Golo Kantè are both sidelined. Eden Hazard and Alvaro Morata should both start in attack while the Pedro and Willian are in contention for the remaining offensive spot. Watford are quickly becoming one of the teams to watch in the Premier League after a blistering start to the campaign. The Hornests, who pulled off a surprise win over Arsenal in their last league outing, currently sit 4th in the Premier League table, a position and two points above Chelsea. Marco Silva's men have lost just one in eight league outings so far this term and have now taken 10 points from their last five Premier League games. Furthermore, the Hornets have managed two goals in each of their four away matches in the Premier League so far this term. Marco Silva may stick with his preferred 4-2-3-1 system, which would likely see Andre Carrillo return on the right wing, and Tom Cleverley to the No 10 role, leaving Richarlison on the left. After his impressive showing from the bench against Arsenal, Troy Deeney may be handed a start at Andre Gray's expense here. Etienne Capoue should return next to Abdoulaye Doucoure at the base of midfield while drian Mariappa may have slipped back behind Miguel Britos in the pecking order of centre-backs after being subbed last weekend. Craig Cathcart, Nathaniel Chalobah and Isaac Success are long-term absentees. Chelsea (3-4-2-1): Courtois; Azpilicueta, Christensen, Rudiger; Zappacosta, Fabregas, Bakayoko, Alonso; Pedro, Hazard; Morata. Watford (4-2-3-1): Gomes; Femenia, Britos, Kabasele, Holebas; Capoue, Doucoure; Carrillo, Cleverley, Richarlison; Deeney. "Chelsea vs Watford betting tips, predictions, lineups, odds and free bets (Premier League - 21.10.2017)"